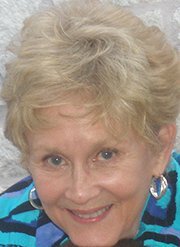 Please welcome fellow Guppy Chapter of Sisters in Crime member Nancy G. West, who says: In my suspense novel, Nine Days to Evil, Aggie Mundeen appeared in my protagonist’s class, capturing her attention and mine. Aggie was funny, smart and insisted I write about her. 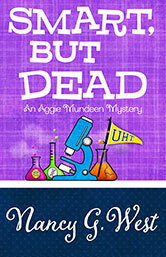 Smart, But Dead, Aggie Mundeen Mystery #3, was released November 2015. Enterprise whisks us to the Hawaiian Island of Maui. For the flight, we’re in comfortable writing clothes, drinking Mai Tais. Dreamy Hawaiian music permeates the ship. My companions are William Shakespeare, Christopher Vogler and Alexandra Sokoloff. The other two question Shakespeare about his approach to developing characters and story lines and creating suspense and humor. Christopher, author of The Writers Journey, tries to determine if the Bard, while writing Chris’ favorite plays, consciously pursued elements Chris deems necessary to a memorable story, or if these elements sprang naturally from the playwright’s imagination. Alexandra Sokoloff, author of Screenwriting Tips for Authors and award-winning novels, probes the Bard about whether he envisioned each scene in a play before committing it to paper. Nobody asks Shakespeare about his use and coinage of exquisite language; we know only he possesses this gift. After I get through blubbering thanks to each one, I interject a timid question now and then, furiously taking notes. I’m too embarrassed to ask if I can tape our discussions. By the time we arrive, we’re old friends talking about writing. I think I’ve gone to Heaven. I’m euphoric at the thought there are even more avenues we haven’t pursued. I use the three-act structure with an eye toward creating an important scene at the end of Act I, at the mid-point of Act II, and at the end of Act II before the Act III climax. That’s the plotter aspect, but if I find something doesn’t work where I put it, I move it. I pantser around writing scenes and dialogue that pop in my mind; I’ll think later about exactly where to place them and what to add. If a new character grabs my attention, I never shut him/her out. I follow them around and watch what they do. I used to finish every book. Not finishing was a sin. Now, I give the author 50-75 pages to capture me with a reason I should go on. If they don’t, I go for the TBR pile, guilt free. I always read them. Do readers “get” what I tried to do? If not, how can I improve the next book? I might add sensory details, suspense, character motivation, or fine points illustrating a relationship; sometimes, I even add a subplot. If I cut something, it’s usually a description of researched elements that support the plot but may give the reader more detail than he/she wants. Aggie Mundeen, single, pushing forty and dreading middle-age, writes the column, “Stay Young with Aggie.” Having moved from Chicago to San Antonio, she has to shape up before anyone discovers who writes the column. I like to put Aggie in a place where unique characters are apt to surface: I know Aggie’s interactions with them will be fun to watch. In Fit To Be Dead, she works on physical improvement at the gym. 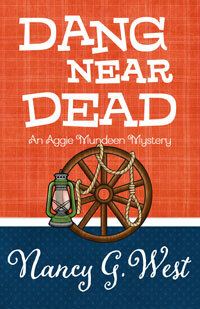 In Dang Near Dead, she vacations at a dude ranch to advise readers how to stay young and fresh in summer. When she hears scientists are on the verge of altering genes to delay aging, she blasts off to the university to learn more in Smart, But Dead. “I’m done.” In my view, properly cooked steaks are done. People are finished. To find more information about Nancy G. West and her writing, go to her website: www.nancygwest.com. At Events, find links to reviews, articles and other goodies. She’s on Facebook, Facebook.com/authorNancyG.West and Twitter: @NancyGWest. Nancy and Aggie chat at https://stayyoungwithaggie.wordpress.com/. You’ll learn things about Aggie Nancy can’t put in her books. If you leave a comment, Aggie or Nancy will answer you. Great interview! Love your Three Act concept. It works with my pantser style but would still give me structure. Will give it a try! Thanks, Judy! The concept came from reading Sokoloff's and Vogler's books listed above. And I'm just about to order John Truby's Anatomy of a Story. That's the wonderful thing about loving to write: you can never learn enough and there are endless possibilities for stories. Thank you for having me as a guest on your blog. Your questions were thoughtful and made me think outside the box. I love talking shop with other writers about methods we use to try to take what's inside our heads and stuff it into someone else's brain. Nancy -- I'm pleased to have you. Jan says "hi." I bet that was a blast. I met her at Bouchercon and bought her new book. She moderated a panel - a real expert. Jim, tell Jan after I read all the books written by our panelists and nominees at Left Coast Crime, I need her to give me some new book recommendations. I like your dinner companion picks! Bummer that you didn't record it. Nice interview. Thanks, Jim and Nancy! Thanks, Janet. You and Kaye and Quincy would make good dinner companions, too. Good interview. I like both the questions and the answers. Great interview and a great series. Thanks, Kait. I'm so glad you think so.